The connection of several tanks to a system can be carried out by means of a control unit or a mini-control unit. Both have from 2 to 4 leads and are equipped on each derivation with a shut-off valve. This valve allows to replace one of the empty tanks without stopping the flow of gas to the plant. Despite this, the relevant legislation states that any derivation on a mini-control unit can not be left free, that means without any connected cylinders, even if the junction tap is closed. This is to make a gas leak less likely in the absence of a perfect closing of the tap itself. As for the control units, each mini-control unit is fitted at the outlet with a pressure reducer, to make the gas pressure compatible with the burners of household appliances and gas cookers. 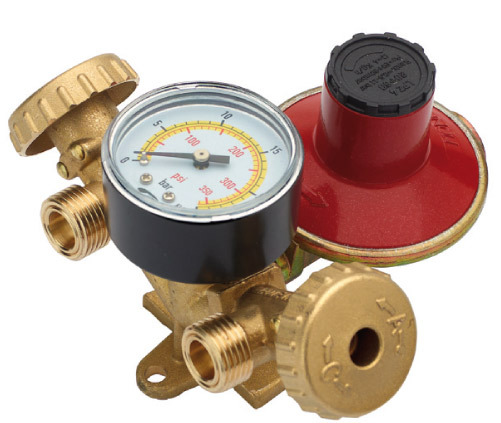 There is also the possibility to monitor the contents of the gas cylinders through the use of a pressure gauge mounted on the body of the control unit. The use of the mini-control unit is typical of the mobile home and camper sector, due to its reduced size. To facilitate assembly, they can be supplied complete with fixing bracket and hoses.